This is one of two aerial views, which focuses on the land east-south-east of the photographer Edward Bennett's vantage point on the Railway Exchange Building, Michigan Avenue. 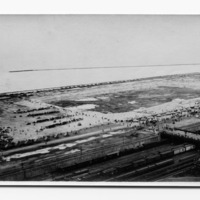 The occasion is a military encampment, 1909-1912, with many small tents across the tracks east of them. The land is built up so that the tracks are below the land level. Bennett's study views from his rooftop near his office reflected his systematic approach to analyzing the interaction of crowds with the not yet developed Grant Park site, at that time an open fairgrounds. Bennett, Edward H. (Edward Herbert), 1874-1954, “Grant Park, aerial view, Illinois Central Railroad Tracks (no. 2),” Digital Collections - Lake Forest College, accessed April 26, 2019, http://collections.lakeforest.edu/items/show/1896.